Rafael Cennamo's intricate beading and attention to details almost reminded me of the Furne One show I saw during LA Fashion Week. 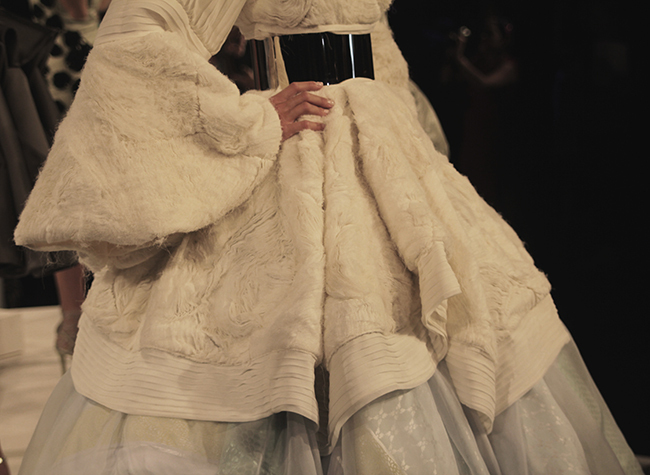 I was impressed by the dramatic avant-garde gowns with embellishments such as cherry blossom and pearls sewn into them. Classy yet contemporary. Monique Lhuillier's show was a celestial water daydream. Rather than watching a fashion show, I felt as if I were gazing out into the ocean with clouds lazily floating by in the background. I saw a lot of peplum, ombre and sequins in the collection. The dresses had fluid, watercolor prints and of course, mermaid silhouettes. The models even resembled mermaids right down to the hair. Effortless and compelling: dresses I would definitely wear. 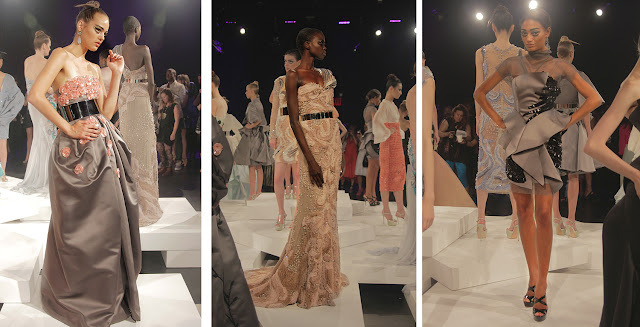 Both designers had a dreamy aspect to their collections-almost as if taking you away into an ethereal realm. Check out how you can win a BASI bracelet here @BASI giveawayhere @BASI giveawayhere @BASI giveaway!! goodness so many eye-catching pieces! I really love all the intricacy, volume and layers especially in that 4th outfit. Whoa you were at all of the shows! You captured some great shots and I love what you wore to fashion week too girl!